special one, the 50,000th bird banded at MBO in our ten-year history. Notes: This was the busiest week of banding at MBO in 2014, and the highest total for week 9 since 2010. As a result, the season total is now ahead of all previous years except 2008, 2010, and 2012 – even though Yellow-rumped Warblers were the big driver behind the high counts in 2008 and 2010, we are seeing in the 2012 and 2014 totals a continuing pattern of above-average numbers overall in the “even” years. 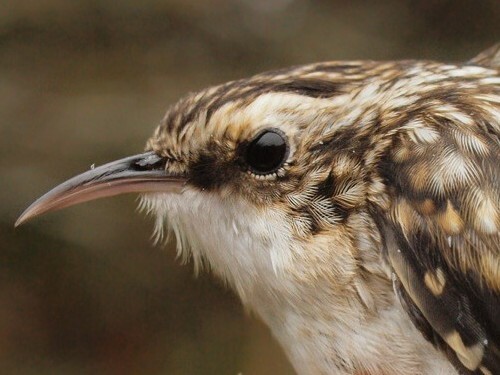 Most notably though, this week we reached a significant milestone, banding our 50,000th bird on September 30 (and just two days later, recording our 10,000th repeat). Although often thought of as a bird of winter, Slate-colored Juncos have already started to arrive at MBO. Two tundra-breeding species showed up for the first time in 2014 on the same day, September 27 – Horned Lark and American Pipit. We also had our first Eastern Screech-Owl observation of the year on September 29. Additional new species for fall were Eastern Bluebird and Slate-colored Junco. We also banded four species for the first time this season – Ruby-crowned Kinglet, Hermit Thrush, Yellow-rumped Warbler, and Slate-colored Junco. White-throated Sparrow remained the top species banded this week, albeit by a narrow margin ahead of Yellow-rumped Warbler. This means that in both weeks 8 and 9, White-throated Sparrow has been number 1 in 2005, 2007, 2009, and 2012-2014 – a remarkably consistent pattern. Even more notably, the count of White-throated Sparrows in week 9 has been between 88 and 112 in each of those years, except for a lower total of 55 last fall. We were wondering what Yellow-rumped Warbler numbers would be like this fall, given strong peaks in 2006, 2008, and 2010, but a more modest high in 2012. Although this week’s total of 85 was nearly the same as in 2012 (84) and much higher than in the “odd” years (ranging from 12 to 33 banded in week 9), numbers already seemed to be tapering off late in the week, and we suspect the season total will be lower than in 2012. Both kinglets increased this week, as we approach their traditional early/mid-October peak. We have now banded 40 Blue Jays over the past two weeks, which is more than in all but two previous entire fall migration monitoring periods. 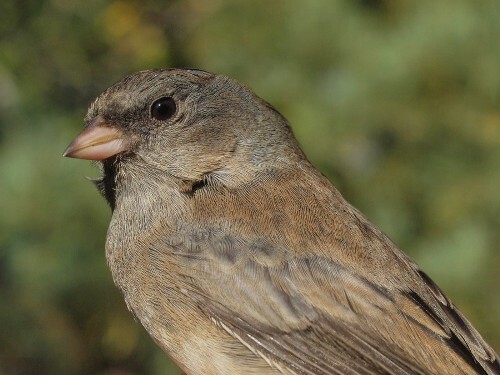 Perhaps the biggest surprise this week was the total of 23 Slate-colored Juncos – this is a late-season migrant at MBO, and our previous high for week 9 was 17 (in 2005); in 50% of years to date, it has not even been among the top ten species at this point in the season. At the same time, Magnolia Warblers are still around in decent numbers, with the season total approaching last year’s record of 284, but likely to fall just short. Also tapering off as we move into October is Nashville Warbler, while Song Sparrow and American Goldfinch returned to the top ten this week. For the tenth year in a row, Canada Goose was the most abundant species observed in week 10, and the numbers this week were close to average. Last week’s mixed blackbird flocks (European Starling, Common Grackle, and Red-winged Blackbird) tapered off a bit this week, but still managed to be three of the five most abundant species observed. Holding steady in fourth place was White-throated Sparrow, in roughly typical numbers for this time of year. Yellow-rumped Warblers were sufficiently abundant this week to enter the top ten for the first time this fall. The Blue Jay migration appears to be starting to taper off, despite the high number banded this week, while American Robins are building to their traditional late October peak. Like last week, Black-capped Chickadee and Ring-billed Gull rounded out the bottom of the top ten. As much as the focus at MBO tends to be on songbirds, we do try to keep an eye on the skies as well, to document raptor migration. 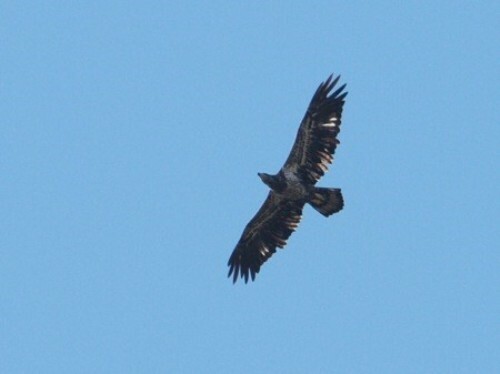 One of this week's highlights was this subadult II Bald Eagle. Meanwhile, our Northern Saw-whet Owl migration monitoring program kicked off for another year this week. We had our most steady “opening week” ever, with owls banded every night, and a strong total of 28 for the week. 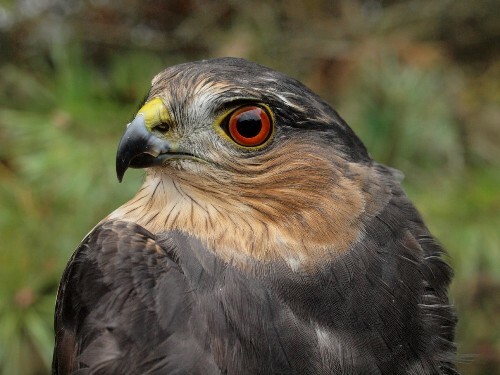 Our busiest night was October 1, with 11 owls banded. Considering that we had heard of poor nesting success in parts of Quebec, this is a very encouraging start to our season. A nice comparison this week between a hatch-year (left) and after-second-year (right) Sharp-shinned Hawk. Another look at the adult Sharp-shinned Hawk. 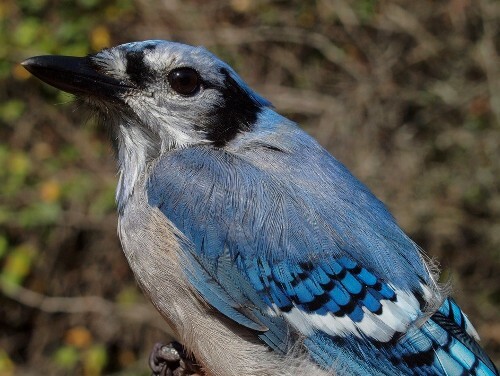 Blue Jays have been migrating in large numbers this fall, including a remarkable 23 banded this week alone.